This post was written as a apart of a Blue Print Social campaign for Plaid Crafts. All ideas and opinions are 100% mine and I’m excited to share them with you! I’m deep in in the piles of Halloween orders with my Etsy shop but I couldn’t resist making a super quick and easy Halloween Wreath. Seriously there are way too many cute things being spread all over facebook and pinterest. It’s peer pressure I tell you. But with my crazy schedule these days it needed to be a project that could come together fast and could handle some weather since my storm door is a little ahem broken at the moment. Luckily Mod Podge came to the rescue on that front. 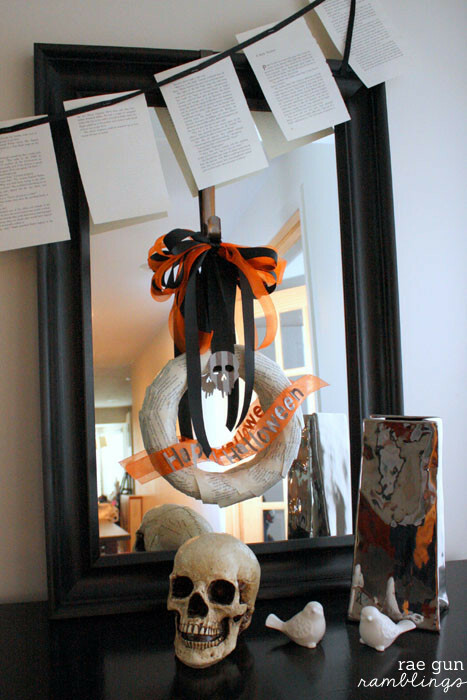 I’ve always really liked book page projects so it makes sense that I’d have a spooky bookish Halloween wreath tutorial for you today. But there’s a little problem. Even though I made it to be safe for outside I’m now torn between whether I like it better outside or hanging inside over the mirror on my hutch. What do you think? 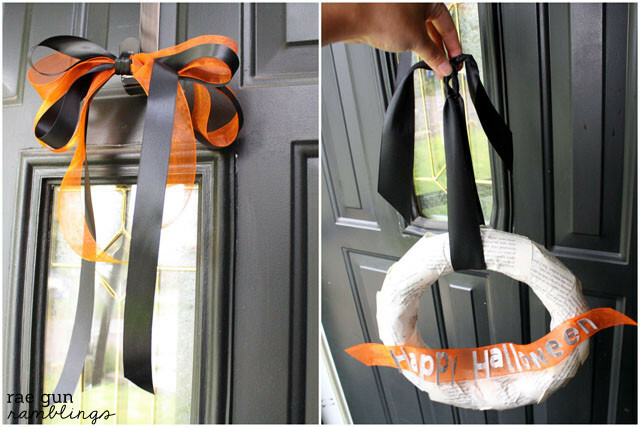 While you think about that here’s my book lover Halloween wreath tutorial. Cut your scrapbook paper. I did mine on my Cricut. The skull is from the “monster bash” cartridge. You can just as easily use pre-cut letters and images from the store. 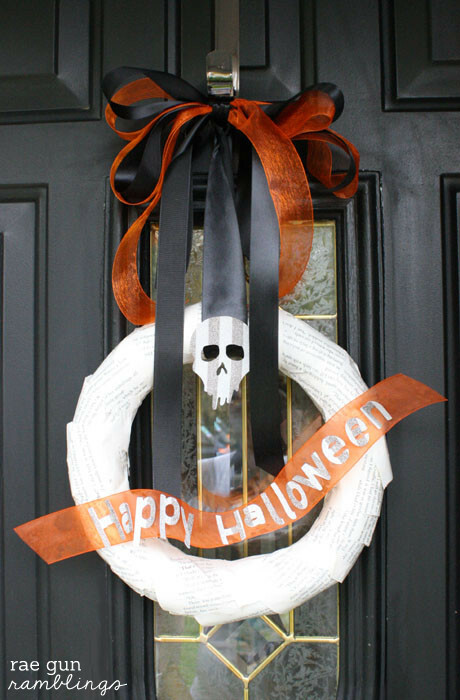 Paint your wreath with a generous coat of Outdoor Mod Podge. Repeat with your letters and skull. Allow to dry completely. 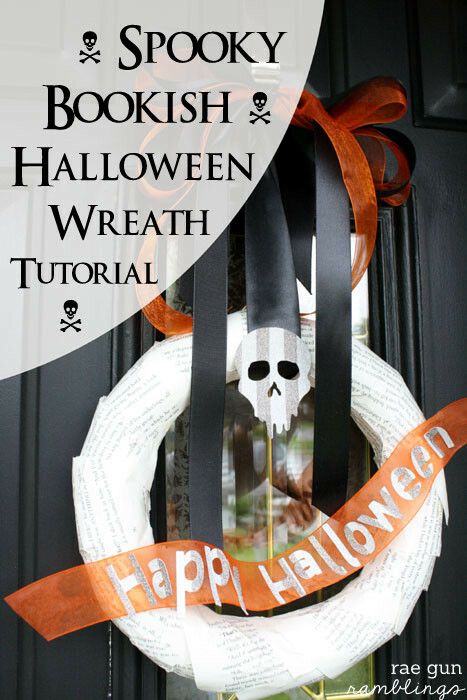 Glue or tape your ribbon in position on your wreath. Glue the letters in place. Make your ribbon by folding both colors in a few loops. Look your hanging piece of ribbon and tie two knots like you did for the bow and then a third to secure the outer knot. 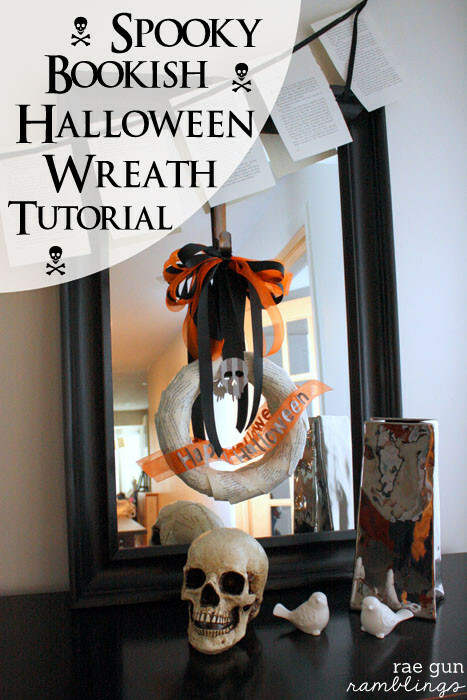 Hang the wreath and top with the bow. Besides the time you need to let it dry this was really quick to put together. I did all the wet stuff one night before I went to bed and then finished it in the morning. But back to the real question do you like it better on my door or on the mirror? Thanks so much to Plaid for the great Mod Podge and Stiffy to try out. Get ideas from fellow crafters on Plaid’s Facebook Page and follow Plaid for inspiration on Pinterest. And to see more awesome outdoor Halloween projects check out these fun posts from my fellow bloggers! Super fun idea! 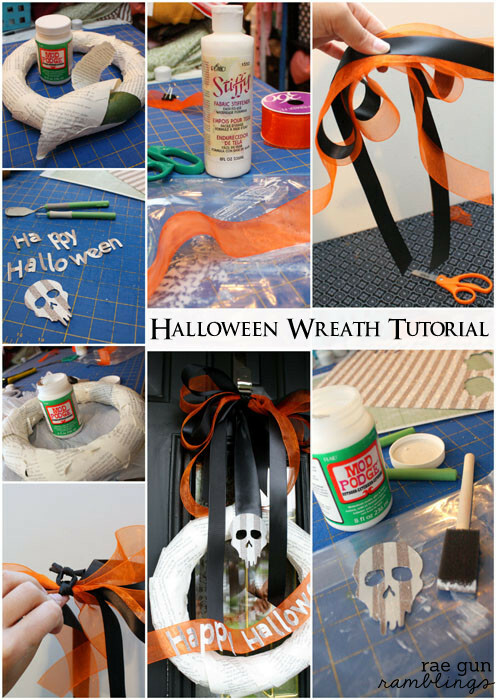 I love find fun new Halloween crafts! This so fabulously darling! I love your use of book pages and I think that ribbon is my favorite. Cute! II agree with you Marissa, I think it will be better to keep this cutie inside, besides it looks great against the mirror! Very unique! Thank you so much for the easy tutorial. Hope you and your family have a great week! less everything you will need when on a camping, hiking or fishing trip. an industry standard since that time. Have you ever thought I would like to sell my car for free? shown who you can trust. Scholl Express Pedi tough skin remover leaves the pores and skin feeling gentle and sleek from your first use. This system is specifically produced to enable the expert removing of hard pores and skin from your toes, appropriate in comfort and ease of your very own property. standing up. Occasionally ongoing stress or rubbing from poor fitting boots and shoes could result in tough skin to build-up. unattractive and often unpleasant really tough skin safely. skin, without resorting to blades. regularly for smooth and gentle sensation feet. a two years guarantee, and included are 2x AA batteries so you could get to work eliminating dead skin cells quickly. a result of mineral micro-grains embedded in the head of the product. it comes complete using a safety stop button. you receive the desired final results of a best pedicure. existing around the roller head. Hi there, this weekend is good in favor of me, for the reason that this moment i am reading this enormous educational piece of writing here at my residence.